To be a successful trader, it is not enough to follow me on Twitter, Facebook or follow Admiral Markets educational and analytical section. Some things you need to learn on your own. Today, I will teach you how to read and understand your MT4 trading statements and other important analytical tools that you might need when trading. Understanding trading statements and history is extremely useful for those who trade multiple instruments and want to see how each of them performs. Another great use of it is that you can test dozens of strategies on the same MT4 and see their merits and flaws. Run MetaTrader, log in, and find Terminal View. To find Terminal View, select Terminal or click CTRL+T, then change tab to Account History. Click MetaTrader Account History to export MetaTrader detailed statement in *.htm format. The Account History tab is located at the bottom of MetaTrader screen as shown in the screenshot below. Looking from left to right, we can see several tabs with separate information. All account information and trade history is found in the Terminal window at the bottom of your MT4 screen within the Account History tab. The tab shows a complete breakdown of all the orders you have placed, including date, time, type, size, instrument, price at open, take-profit and stop-loss levels, price and time of close, swap fees, and profit. Once your trades have been closed, your account history is stored in the server. Order: Unique operation ticket number. Time: Time indicating when the position was opened. It is shown in the YYYY.MM.DD HH:MM:SS (year.month.day, hour:minute:seconds) format. Type: Trade operation type. Three types of trade operations can be found here: Balance, or the initial deposit that shows funding of the account, Buy represents a long position, while Sell, a short position. Size: This is the amount of lots in the trading position. Symbol: This field shows the name of the instrument in the trading position. Price: The actual price at which the position was opened. S/L: The actual level of a stop-loss order placed. If a trade position is closed by this order, the corresponding cell will be shown in red. If no order is placed, zero value will appear in this field. On the other hand, if an order is placed, but doesn't trigger, its value will still be shown in this field. The cell will be not be coloured. T/P: The actual level of a take-profit order placed. If a trade position is closed by this order, its corresponding cell will be shown in in green. If no order is placed, zero value will appear in this field. Conversely, if an order is placed, but doesn't trigger, the value will still be shown in this field. The cell field will not be coloured. Time: Time of position closing. It is given in the YYYY.MM.DD HH:MM:SS (year.month.day, hour:minute:seconds) format. Price: The price of closed position. Swap: Swaps (overnight rate) charged. Profit: The final financial result of transaction. A positive number means the transaction was profitable, and the negative one, vice versa. The profit is shown in the deposit currency here, unlike it is in the field of the same name in the Trade tab. Additionally, you can opt to see the following tabs: Commissions, Taxes, and Comments. Commissions represent the cost charged by the broker company for performing a trade operation. Taxes show taxes for performing trade operations, while Comments can be entered on different trades. Comments are stored and can be entered only at position opening or placing an order. The comment cannot be changed when an order or a position are being modified. Also, your brokes can enter comments about a specific trade in this field. The report is just as important showing the essential data of your trading account. Deposit/Withdrawal is the total result of deposits and withdrawals to/from the account over the reporting period (if no deposits or withdrawals are made, Deposit/Withdrawal will read 0). Credit Facility shows the credit available. Closed Trade P/L shows the total profits or losses from transactions closed during the period. Floating P/L shows the total floating profits and losses on all transactions open on a client's account at the time the report is generated. Margin shows the total margin for all open transactions at the time the report is generated. Balance is the total financial result of all completed trading and non-trading transactions on the trading account at the time the report is generated. Equity is the total financial result of all completed trading and non-trading transactions as well as open positions on the trading account at the time the report is generated, calculated using the following formula: Equity = Balance +Credit + Floating Profit - Floating Loss. Free Margin shows the funds available to open a new position at the time the report is generated, calculated using the following formula: Free Margin = Equity -Margin. In addition to regular trading reports, MT4 allows you to generate a detailed report, which also includes additional information about your trading account, allowing you to analyse your trading performance more thoroughly. Detailed report will show you these fields in the trading statement. Right click the Account History tab and select Save as Detailed Report. 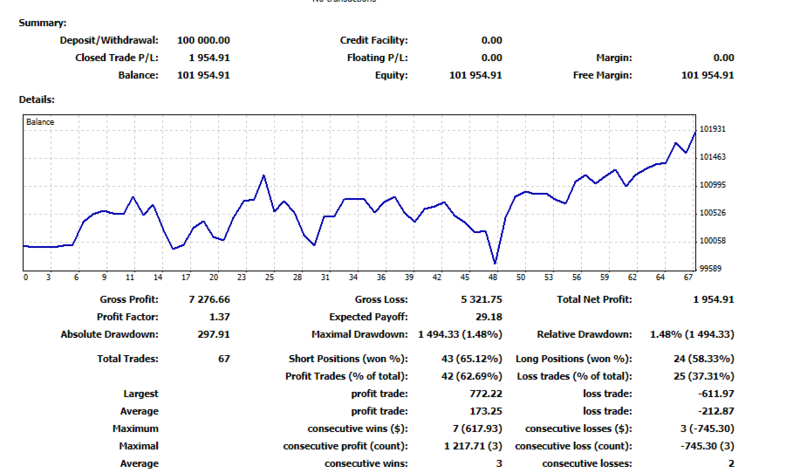 Total Net Profit: The financial result of all trades. 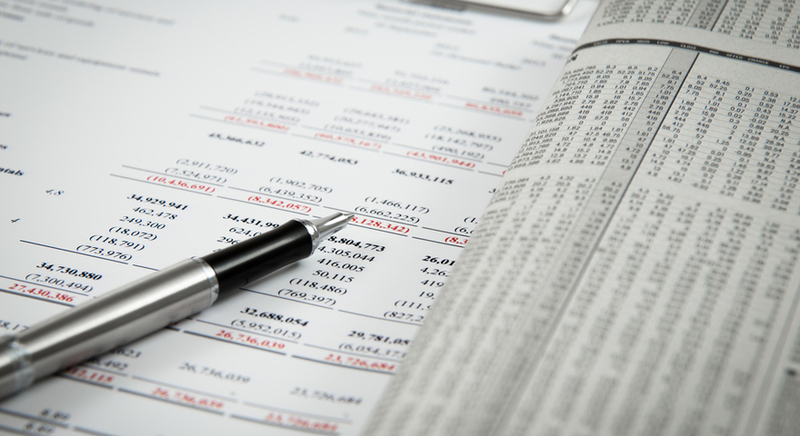 This index represents the difference between the gross profit and the gross loss. Gross Profit: The sum of all profitable trades in terms of money. Gross Loss: The sum of all unprofitable trades in terms of money. Profit Factor: The ratio between gross profit and gross loss in per cent. The one value means that profit equals to loss. Expected Payoff: The expected payoff is a statistically calculated index that represents the average profit/loss factor of a trade. It can also be considered when it comes to the expected profit/loss factor of the next trade. Absolute Drawdown: The largest loss is lower than the initial deposit value. Maximal Drawdown: The maximal loss of the local maximum in the deposit currency and in per cent of the deposit. Relative Drawdown: The maximal loss in per cent of the maximum balance value and its corresponding money value. Total Trades: The total amount of trade positions. Short Positions (won %): The amount of short positions and percentage of won thereof. Long Positions (won %): The amount of long positions and percentage of won thereof. Profit Trades (% of total): The amount of profitable trade positions and their percentage in the total trades. Loss Trades (% of total): The amount of loss trade positions and their percentage in the total trades. Largest Profit Trade: The largest profit among all profitable positions. Largest Loss Trade: The largest loss among all unprofitable positions. Average Profit Trade: The average profit value for a trade (the sum of profits divided by the amount of profitable trades). Average Loss Trade: The average loss value for a trade (the sum of losses divided by the amount of unprofitable trades). Maximum Consecutive Wins ($): The longest series of profitable trade positions and the sum of their wins. Maximum Consecutive Losses ($): The longest series of unprofitable trade positions and the sum of their losses. Maximal Consecutive Profit (Count): The maximum profit of a series of profitable trades and the amount of profitable trades corresponding to it. Maximal Consecutive Loss (Count): The maximum loss of a series of unprofitable trades and the amount of unprofitable trades corresponding to it. Average Consecutive Wins: The average amount of profitable positions in a consecutive profitable series. Average consecutive losses: The average amount of unprofitable positions in a consecutive unprofitable series. Except for standard MT4 statements, it is important to keep in mind other essential factors that can be found in some advanced analytical tools, e.g., myfxbook.com. The information might help you find additional flaws and merits of your system, money management, and trading style. Profit Factor shows how many times the gross profit (sum of all winning trades) exceeds the gross loss (sum of all losing trades). The higher the value, the better. Standard Deviation is a statistical measure of volatility. It shows how much variation or dispersion there is from the mean (expectancy). Sharpe Ratio is used to characterise how well the return of an asset compensates the investor for the risk taken. The higher the value, the better. Z-Score (Probability) is used for calculating the ability of a trading system to generate wins and losses in streaks. It enables us to see if the streaks generated are of a random pattern or not. Expectancy tells you what you can expect to make (win or lose) on every trade. Arithmetic Average Holding Period (AHPR) is the average holding period return. Geometric Average Holding Period (GHPR) is the geometric holding period return. It is important to know that you should try to keep expectancy positive, while analysing the AHPR and GHPR data is extremely important for traders who want to use compounding. If you have any questions, please feel free to ask in the comment section below!